What is the Mental Health & Addictions Crisis Centre? The Crisis Centre will provide 24/7 walk in support for individuals experiencing a mental health and/or addictions crisis that do not require hospital or emergency service interventions. Opening January 11th, 2016 and located at 648 Huron St., London, the Crisis Centre houses the Crisis Assessment Team, Crisis Mobile Team and can provide access to 5 off-site crisis stabilization beds. The building is a warm, welcoming environment that will be open for walk in self-referrals and community referrals 24 hours a day, 7 days a week. Who can use the Mental Health & Addictions Crisis Centre? Any person 16 and older will be able to walk in to the Crisis Centre starting January 11th, if they are experiencing a mental health or addictions crisis. What is considered a mental health or addictions crisis? A mental health and/or addictions crisis can include: a serious, immediate mental health or addictions problem, a situational crisis, psychosis, risk of self-harm or harm to others, emotional trauma, agitation or unable to sleep as a result, severe depression or anxiety, symptoms of moderate withdrawal and needing support, or suicidal thoughts. 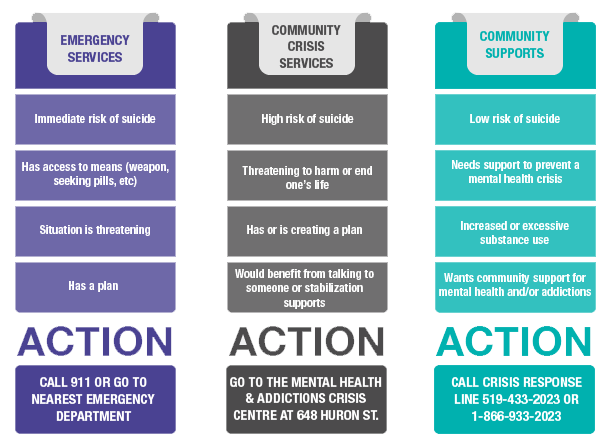 If you aren’t sure if you are in crisis, you can call the Crisis Response Line at 519 433-2023 or 1-866-933-2023 to talk to volunteers who can help you determine what supports you need. What kind of services will the Centre provide? The Crisis Centre will provide supportive counselling and assessment for immediate crisis issues and referrals to other services for on-going, non-crisis issues. Referrals can be made by staff to treatment and case management services, social & recreational activities, life skills development, vocational and housing supports, withdrawal assessment and Telewithdrawal Management Support. The centre will also house the Crisis Mobile Team which can respond in the community and can provide referrals to the crisis stabilization beds for individuals experiencing non-emergent crisis issues. How do I know if I should go to the Crisis Centre or the Hospital? Every situation is different. The Mental Health & Addictions Crisis Centre provides immediate, therapeutic and community supports during a crisis and works closely with the hospitals and other community partners to help individuals get the supports they need in a crisis. If you don’t need urgent medical attention, consider visiting the Crisis Centre instead of the Emergency Department. If you are in a threatening situation to yourself or others, are at immediate risk of suicide or harm, or require medical or emergency intervention, you should call 911 or go to the hospital. Who can’t go to the Crisis Centre? If you are under the age of 16, contact the Children’s Crisis Intake Team, available 24/7 at 519-433-0334. If you are at high risk of harming yourself or others, please call 911. If you are in urgent need of medical attention, please visit your local hospital. Does someone need a referral to the Crisis Centre? No referral is needed and individuals are welcome to walk in when they need support. If you are a health provider, are a family member/caregiver or another service provider who would like to support the treatment plan of an individual in crisis, you can connect with staff as well. What if an individual needs support but is not in crisis? If you feel an individual is in need of emotional support, you can suggest they call the Crisis Response Line at the London Distress Centre at 519-433-2023 or 1-866-933-2023. Volunteers are able to connect with our Crisis Mobile Team if needed. How can I get more information and resources about the Crisis Centre? Starting in January, we will be sharing information and resources you can hand out to individuals who may benefit from the Mental Health & Addictions Crisis Centre. You will be able to find brochures and other resources at any of our CMHA Middlesex or Addictions Services of Thames Valley sites. What is the contact information for the Crisis Centre?